Snack Time is Delicious and Healthy with Pure Snacks! As I have mentioned many times before, I am a big snacker because I try to eat about every 3 hours to keep my metabolism high. I also have to always have good, healthy snacks on hand for my children, especially for my son's lunchbox this school year! And there aren't many companies that make great snacks for the whole family and are organic and healthy but that is why Pure snacks are one of my favorite brands to have in our house! The Pure mission is to deliver healthy snack solutions and nutritious, innovative foods for the whole family by using simple, wholesome, real ingredients that nourish the body and mind. 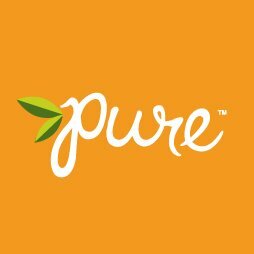 Pure’s line of products are always organic, non-GMO, gluten-free and vegan and include the Ancient Grain bars, Organic fruit + nut bars, Crispy Clusters (a light nut & grain cluster) and Fruit Snacks/Fruit Sandwiches. My personal favorite snack from Pure are their Pure Ancient Grains bars. They are certified organic, non GMO, vegan, gluten-free, soy free, kosher and made with their exclusive Pure Ancient Grains blend to deliver balanced nutrition using whole food ingredients. I seriously look forward to snack time every day when I get to have one of these Ancient Grain bars. They are so delicious and healthy and they are soft and chewy! A crispy, lower sugar, decadent bar like a rice crispy treat that includes Pure Ancient Grains (quinoa, crispy brown rice, amaranth, flax seed and hemp), 5 grams protein, 6 grams sugar, 3-5 grams, fiber and 160 calories. And my kids LOVE the Fruit Sandwiches! They are triple layered, dual flavored treats made with fruit and vegetable juices and purees, only 60 calories and 12 grams of sugar per sandwich with no cane syrups or cane sugar, and no artificial flavors or colors. Pure Fruit Snacks are certified organic, non GMO, vegan, gluten-free, soy free, kosher and made with fruit and vegetable juices and purees. They are so fun to eat and tasty! And the Pure Crispy Clusters are perfect for the whole family! They are crunchy bite-size snacks made from Pure Ancient Grains, gluten-free oats and nuts. They are certified organic, non-GMO, gluten-free, soy-free, dairy free, and kosher, and include three delectable flavors: Chocolate Pecan, Salted Caramel and Honey Peanut. Every single snack and flavor from Pure is amazing and delicious and the whole family LOVES them! We do a little bit of a happy dance every time we get to eat Pure snacks for snack time! You can purchase Pure snacks on the Pure bar website or at a local retailer.